Sen. Lisa Murkowski’s (R-Alaska) re-election seems ethereal: she lost the primary election, but went on to win in the general contest as a write-in candidate. There is some speculation that her campaign was bolstered greatly by the changes in finance laws that took place over the last year. “Super PAC” Alaskans Standing Together raised over $1.7 million toward Murkowski’s campaign, in 38 days to push the incumbent senator to the front of the race. Lady Gaga has again gone on the offensive against DADT, issuing a new video encouraging the Senate to repeal what she calls an “archaic” policy. The Wikileaks era may mean more opportunities for lobbyists to represent foreign governments, “not in the traditional lobbying role, but more communications strategies,” Roll Call reports. Lady Gaga uses her international stardom to speak out against "Don't Ask, Don't Tell." Don’t Tell” policy. Time magazine reports that the 9th U.S. Circuit Court of Appeals, the court that stayed the ban on openly gay military personnel, is “regarded as one of the most liberal in the land.” Tell that to Lt. Dan Choi and other gay and lesbian soldiers ousted by the military recently. 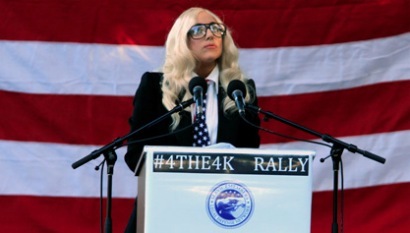 Lady Gaga, an openly bisexual pop star, has led the charge of celebrities fighting DADT. She has been the most vocal advocate on the subject, it seems, pulling stunts like wearing a meat dress to symbolize her belief that if not repealed, the policy reduces the LGBT rights to equal those allotted a piece of meat, and recording a seven minute advocacy video. Interestingly, neither Lady Gaga nor Russell Simmons has filed an LD-1 or -2 form, making them merely advocates, and not officially lobbyists. Unless, of course, they are lobbying and think their celebrity status will save them from repercussions related to not filing. Other entities embroiled in the fight against DADT include the American Nurses Association and the American Bar Association. The changing of Congress following yesterday’s election is expected to play a major part in the future of “Don’t Ask, Don’t Tell” legislation.